Abstract: A 77-year-old-male patient presented with recurrent gross hematuria for 3 months with a fever for 1 month, and so was admitted to The First Hospital of Tsinghua University. The medical history revealed the patient exhibited no symptoms of night sweat, dysuria, or abdominal pain. The patient experienced sustained fever with maximal temperature of 39°C for 1 month without any infectious symptoms. The biochemical examination revealed that renal and hepatic function tests were normal. Serum prostate-specific antigen and free prostate-specific antigen were at a normal level. Enhanced computed tomography and magnetic resonance imaging was performed and indicated prostatic cancer with bilateral pulmonary metastases. 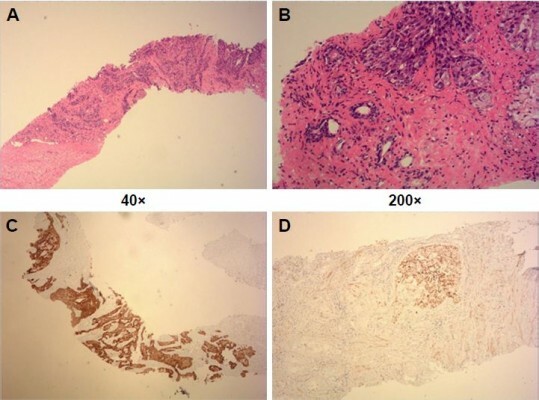 Subsequently, prostatic urothelial carcinoma was confirmed by a histopathology assay of the prostate biopsy. Following 1 course of chemotherapy, the temperature of the patient returned to normal.